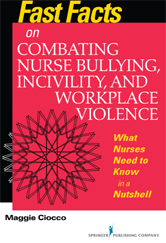 This pocket-sized, quick-access guide gives nurses crucial information they need to know to understand, identify, and effectively counter incivility, bullying, and violence in all nursing settings. 2. What Is a Bully?